A recent addition to the EFS 4×4 Accessories product range is their VividMax high performance LED light bars built to the high standards we’ve come to expect from EFS. Durable aluminium casing which aids heat dissipation when the lights are running. 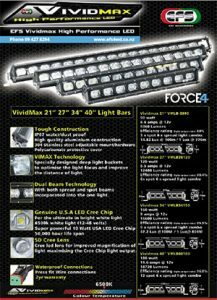 These light bars are dust-proof and rated IP67 water. Voltage 12-48V DC. Available in four sizes: 21, 27, 34 and 40 inch, these 5D optic light bars boast a bright 6000K true white light for optimum visibility during night driving. 7” and 9” round spot lights are also available.